As modern day martial artists, we owe a great deal to those who formulated and developed our arts. I love to read their works, and stories about these great men and women. By studying the past greats we can gain inspiration and we can fully appreciate our arts as we can view them in their correct historical perspective. There is a good chance that the art you practice originated in the orient. However, we should not forget about our own indigenous fighting systems and their masters, as they are every bit as effective as their oriental counterparts and they also make up a large part of our martial heritage. I would class myself as a "traditional karateka," and yet as a regular part of my training I hit a punch bag, jump rope and spar using boxing gloves - as I'm sure many of those reading this article do also. The western art of boxing has had a huge influence on all the martial arts. Hence, in addition to studying oriental martial arts masters, I also like to read about the masters of the native art of boxing. One such master was James Figg. 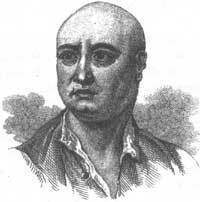 James Figg was born in Thame Village, Oxfordshire in 1684 and went onto become the first recognised champion of boxing. Figg was six feet tall, weighed 185 pounds and was well versed in both armed and unarmed combat. History tells us that it was the Earl of Peterborough who first spotted Figg's potential after witnessing him giving a demonstration of boxing, fencing and the use of the quarter-staff on the village green. The Earl took Figg down to London where he would fight all comers, teach his fighting methods and give demonstrations of his skills. Figg became a popular figure and many people wished to learn from him and watch him fight. In 1719, Figg opened a boxing academy, which held over 1000 people, where he and his students would teach and demonstrate their skills. Figg's business card for his academy declared him to be, "Master of the noble science of defence." Figg never lost a fight and was considered to be the champion of Great Britain until he retired in 1730. As Figg's reputation grew, more and more "gentleman amateurs" took up boxing as a pastime and sought out Figg's tuition. One of Figg's students was a 'Captain Godfrey' who wrote, "I have purchased my knowledge with many a broken head, and bruises in every part of me." This statement emphasises the realistic, and sometimes harsh, nature of Figg's tuition. Figg also drew upon his extensive knowledge of fencing to enhance the empty-handed fighting skills of his students. The parries & ripostes of fencing had a large influence upon what became parries & counter-punches of modern boxing. The boxing that Figg taught and practised was markedly different from the boxing of today. Although hitting with fists was emphasised, a boxer could grapple and throw his opponent (the cross-buttock throw being a favourite) and then either hit him when he was down, or continue to grapple whilst on the ground. Indeed, it was not until 1743 - 13 years after Figg's retirement - that kicking an opponent whilst he was down ("purring" as it was called at the time) and gouging were banned from the 'sport'. Whilst the original art of boxing was a complete system that covered all ranges, the skills of kicking, grappling and ground work are completely omitted from the arts modern offspring. And this situation is by no means unique to boxing. As examples, Judo and Aikido tend not to include the striking skills that were once a fundamental part of the art. And the vast majority of karateka no longer include the grappling and groundwork associated with the karate katas in their training (read my book, "Karate's Grappling Methods" for further details). This "specialisation" does have an upside however, as it has resulted in these specific skills being taken to extremely high levels. There can be little doubt that when it comes to punching, modern boxing is head and shoulders above all other arts. As an example of how complete boxing was, I shall tell the tale of one of Figg's most famous fights. On the 6th of June 1727, James Figg fought Ned Sutton - a pipe maker from Gravesend. The bout generated huge interest and amongst the audience were many important names of the time, including Sir Robert Walpole - the Prime Minister. The first match was to be with swords! Which goes to illustrate that the use of weapons were also part of a boxer's training - Much the same as weapons were also a part of the training of the majority of eastern martial arts. The first thirty minutes of the bout were fairly uneventful until Sutton went on the attack, which resulted in Figg cutting his arm on his own sword. Under the rules this did not count, and hence the bout continued. It was in the sixth round that Figg cut Sutton's shoulder, which resulted in Figg being granted the first victory. After a thirty-minute interval, the "Fist-Fighting" began. After eight minutes Sutton executed a throw which resulted in Figg being dumped at the umpire's feet. Figg immediately regained his feet and went onto to throw Sutton such that he required time to recover as the result of the bad and heavy landing. When the bout continued, Sutton landed a blow that was so powerful that Figg was knocked clean off the stage (ropes were not used at the time) and into the audience. Figg recovered and went onto punch Sutton to the floor, where he then grappled Sutton into submission. The final bout was with Cudgels, during which Figg broke Sutton's knee and hence secured a three-nil victory. The description of Figg vs. Sutton bout shows how grappling, groundwork and weapons skills were as much a part of boxing as the punching for which the art is so revered today. This tale also helps to show just how skilful and knowledgeable a martial artist Figg was. How many of today's martial artists would have the skills and the courage to fight in no-holds-barred contests where the contests fought with bare knuckles, and live swords & cudgels! When you consider that Figg was also never beaten, I think it becomes clear just how talented a martial artist he was. Not only was Figg a great fighter himself, but he was also great teacher. When Figg retired in 1730, the title of Champion was claimed by one of Figg's pupils - Jack Broughton, who was to retain the title of champion for 20 years! In 1741, Broughton fought George Stevenson. The fight lasted just under 40 minutes and was considered "brutal" even for the day. Both men took severe punishment until Broughton landed a solid blow just below Stevenson's heart. Stevenson dropped to the floor and did not get up. Broughton was heard to say, "What have I done? I've killed him!" Stevenson eventually recovered enough to pay his respects to Broughton before once again losing consciousness. Stevenson never recovered and died from his injuries a month later. During that month the two pugilists had become good friends and the death of Stevenson greatly upset Broughton. So much so that Broughton went on to devise the first set of rules in an attempt to make boxing matches safer. Amongst these rules was the declaration that at the beginning of each round a man would be given 30 seconds to make his way to a line at the centre of the ring, if they failed then they forfeited the bout. This line was referred to as the "scratch," and the term "not up to scratch" has now found its way into everyday usage. Broughton is also accredited with inventing the first ever pair of boxing gloves, or "mufflers" as they were called. However these "mufflers" were only used in training and were not worn in bouts proper. James Figg is without a doubt one of history's greatest martial artists. I'm sure many would argue that the art he practised was brutal (as was life at the time) and horrific (they would be right) and hence we would be wrong to class him as a martial artist at all! It is here that I must disagree. All of the arts where born out of violence and violent times. That is why they were necessary in the first place. One of my favourite quotes is that of Master Azato (one of the karate teachers of Gichin Funakoshi - founder of Shotokan) he said, "A true martial artist is one who's smile will warm the hearts of little children, and who's anger will make tigers cower in fear." I think this perfectly sums up the paradox that all true martial artists should aspire to - on the one hand, to be kind, gentle and benevolent, and other the other hand, to be capable of dealing with violence when no other option is available. If we simply try to ignore the brutality of combat, we fail to adequately prepare ourselves, and, by default, we actually promote violence! It is only when we fully acknowledge just how futile and revolting violence can be, that we will do everything in our power to avoid it. And if we can't, then we are greatly indebted to men like James Figg for the sacrifices they have made to ensure we have the knowledge to deal with the violent behaviour of others. Although the boxing that Figg practised was brutal, it was also considered, "noble" and a fitting pastime for society gentlemen. Like its Oriental equivalents, Boxing was considered to be not only a means of self-defence, but also as a means through which people could better themselves through discipline and the overcoming of adversity, and hence be of more use to society.